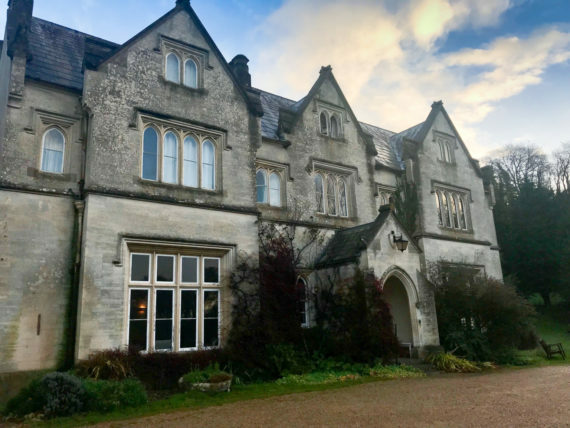 At the end of November all fellows attended a residential at Hawkwood College in the Cotswolds where we were introduced to the mentors for the first time. This residential felt like it marked a starting point as this was the first opportunity we had to introduce ourselves and our practices to each other. Being in a setting away from home and the normalities of daily life meant we were able to really focus on the fellowship; both the ideas that were introduced and the new connections made with the other fellows and mentors, as well as Dom Breadmore and Anne Forgan of Ludic Rooms, Coventry. I really feel that there is so much to gain from spending time with people over an extended period such as the two days and one night we spent at the residential opposed to just meeting for a day of presentations. Whilst it is really interesting hearing everyone speak about their practices, there is something very valuable in those in-between moments. It was during the cake and coffee breaks (there was lots of coffee and even more cake!!) and over the table during meal times where conversation was really valuable. Those are the moments where the nerves of speaking in front of a group dissipate and where through speaking and listening and laughing that connections are made. I found it to be an enriching experience, listening to others speak about the lenses through which they see the world and make their work. As an artist who spends a lot of time sat in a studio at the bottom of my garden on the side of a hill, I really do value those opportunities to speak with and listen to others. I will never get bored of learning about the processes of others; I find that looking outward and hearing about others’ processes enables me to better reflect on my own practice, and prompts me to question why I make the choices I do make in my practice. Surprisingly I found it particularly useful to be around people who have never seen or heard of my practice. It meant that I had to be able to articulate the concepts and projects that I work with in my practice clearly. This served as a valuable experience as I had to carefully choose my words, and through doing that I had to clarify my practice to myself. I find that speaking about your practice can really help with reflection on your practice. I sometimes find that as I am speaking about my practice I have an internal monologue responding to what I say… I sometimes think to myself, ‘why did you say that, that’s not what you think at all!!!’. It’s through this internal questioning and reflection that comes through conversation that a space is made for growth. I think that conversation is the only way to have realisations of this kind – I believe that this is why so much growth and development happens whilst studying; having to articulate your work clearly during tutorials, critiques and presentations prompts you to have this reflective development and self awareness. Outside of studying this is difficult to maintain, especially on the side of a hill with only sheep for neighbours!! Thinking back to the residential, when thinking about technology and introducing it to our practices, I really valued Dom’s illustration of inputs/outputs. 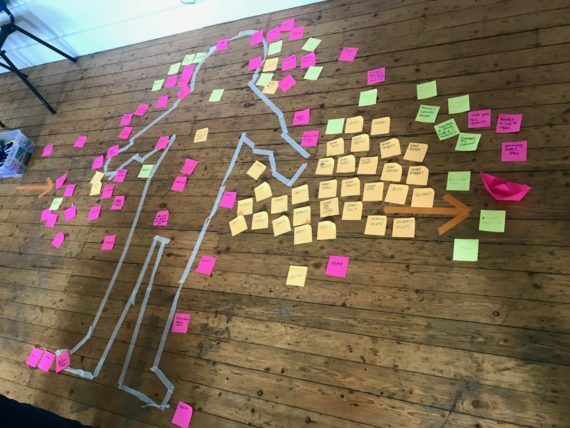 With a human figure drawn out on the floor, we were handed post it notes on which we were told to write inputs or outputs and to place them on the drawn body where we felt appropriate. This exercise really brought to mind the experiential aspect to working with technology. The question, ‘what do you want people to experience?’ really brought to mind how this was very much about human experience, which contradicts my previous thoughts of technology as being a removal of the human. This felt reassuring to me. I am keen to create immersive experiential spaces in my work, and the way that Dom spoke about inputs and outputs aligned with thoughts Ive had in relation to installaction; thinking about how an action then has consequential experience for both artist and viewer. Dom stressed on the importance of the consideration for human experience – this alone has made me feel that technology is much more accessible to me now, just by altering my viewpoint / perspective on it. As I stood looking at the visual of the body with all these varying inputs/outputs I was reminded of the way that I have always associated the body as a system of processes and a point of transformation. I am fascinated that we occupy this corporeal space which is always working and processing, both using matter and generating it. This connection between the body and technology has sparked my thinking, and I am curious to see how this can be explored further. During the residential, mentors spoke about their practices and the technology that they make use of, and Dom introduced us to varying technologies ranging from the various types of mics and LEDs to touch sensitive technologies, conductive paints and Arduino. Dom’s comment, ‘If you can think of it, it can probably be achieved through these technologies’ was particularly inspiring and I felt slightly dazzled by the endless potential! The more I heard of these different technologies, the more seduced by them I felt – my inner child felt like I had just arrived at a theme park and wanted to have a go on all the rides! I wanted to play with contact mics, conductive paint, live coding, laser cutting, all of the things, all at the same time! Obviously, this is not possible and whilst I want to cast my net out wide and be experimental, I also need to anchor myself and maintain a focus. I need to remind myself that the tech is there to support the concepts and ideas, opposed to just playing with the tech just for the sake of it. I am hoping that my first mentoring session will help me to regain my focus and move forward whilst still being experimental.